The personal blogging space of William Hertling. With three small kids, we have a yard full of strollers. Single strollers, double strollers, even triple strollers - in normal, umbrella, and jogging styles. But we lacked a good double jogging stroller and we lacked a bike trailer. 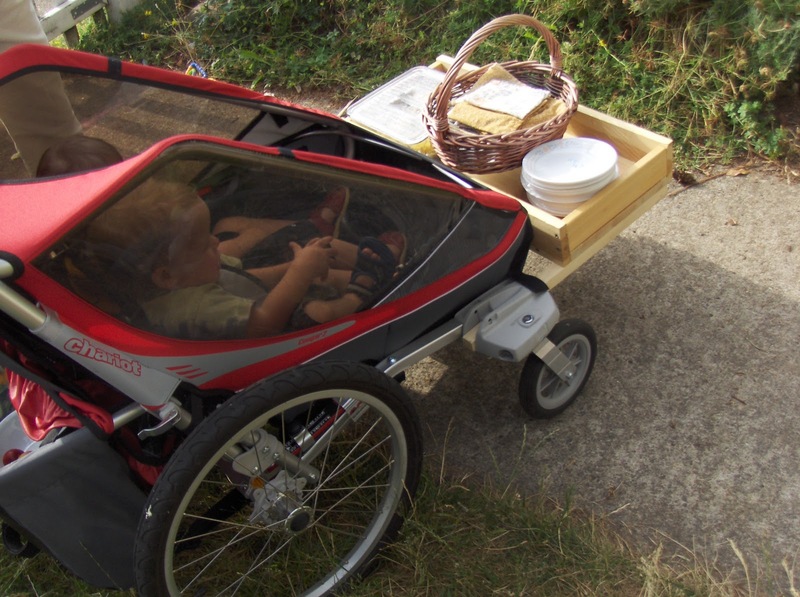 We knew that some bike trailers could convert to become jogging strollers. After a bit of review, we narrowed our options to a Burkey D'Lite trailer or a Chariot Cougar. After reading the canonical comparison between the Burley and the Chariot, we were leaning in favor of the Chariot, especially because we wanted a good walking/jogging stroller - and while biking was important, it wasn't the sole use. Having bought the Chariot Cougar, we started using it. And living within convenient walking distance of the grocery store, a very regular use of the stroller became visits to the grocery. And which point, you're left with the question of where to put the groceries. The Chariot does have a very nice cargo area on the back of the stroller. It fits about two large bags of groceries, but because the space is narrow, it's not as easy as just putting two bags in. Instead, we end up packing the groceries directly into the cargo area. It works, but then it becomes time consuming when you get home to carry individual items into the house. The other problem, as I'm sure that every parent has run into with funny (and/or dangerous) results at times, is when the stroller becomes too back-heavy, tipping it back and sending your child into the air (or simply flipping over backwards when you lift your child out.) This can happen with just a heavy diaper bag, never mind with really heavy stuff like quarts of goat milk and jars of baby food packed into the cargo area. The Chariot is a very adaptable chassis. It can function as a bike trailer, regular stroller, jogging stroller, and even ski stroller. I noticed that the chassis has two square openings used for the jogging stroller, ski stroller, and bike trailer attachments, but that these square openings were not in use when the stroller had just the regular swivel wheels on front. Since these openings were clearly make to handle some weight, they would be strong enough to carry a front cargo tray, right? I purchased two 4 foot, true 1x1 square rods at the lumber yard, and used some spare lumber to create a cargo tray. The cargo tray will hold three large grocery bags side by side. 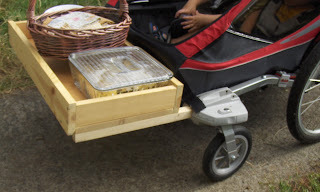 It's flat, and has sides, so it can hold a variety of other things that need to stay stable - such as in these pictures when it's carrying our dinner and some plates we were borrowing for a party. The front and rear cargo areas work well together. By providing a little extra weight on the front, even when the rear area is loaded heavily, the stroller will not tend to tip over backwards. The front cargo area, by virtue of its size, lends itself to all kinds of things that you couldn't even consider without it: such as carrying three kids worth of soccer gear, spare clothes, water, and snacks to the park for a morning of soccer. 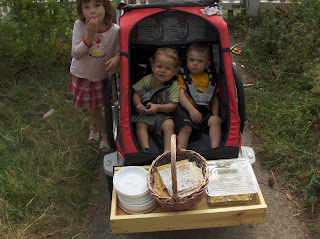 Between kids and the two cargo trays, I'm way overloading the Chariot, but it doesn't seem to mind at all. (The factory rear cargo area is only rated for 5 pounds capacity, but I've easily put 20 pounds or more in it.) The stroller is very solidly built. To build the tray, I first sanded the two 1x1 pieces to take a little off, as the actual tube opening is about 1/16th of an inch less than true 1x1. I put the two 1x1 in place, cut the wood for the bottom of the tray, and then screwed it onto the 1x1s while they were in place. This helped me keep the exact alignment needed. It's a snug fit, and I rely just on friction to hold the tray in place. This seems to work well, although there are definitely holes in the chassis themselves that would lend themselves to a cotter pin if needed. The one downside is going up curbs without a cutout. With weight in the front tray, it can be hard to get enough leverage to get the front end to pop up over the curb. If it is very lightly loaded, you can do it. Otherwise you need to plan your route to take into account curb cutouts. This is a great hack. I've been considering modifying the stroller handle to accommodate my vertically challenged wife. Have you seen anyplace else on the web where Chariot hacks are mentioned? No, I haven't, which is too bad. It's a great stroller, and I can imagine lots of builds off it. I am going to try to purchase a 2nd seat for a strollerc such as the britax stroller and try to attached it to the front of a single cougar chariot to carry a second child. Hopefully works as well as your tray. These Trailers looks so awesome to carry the baby towing with any ride like motorcycle or car. Thanks for sharing! Copyright 2005-2012 by William Hertling. Simple theme. Powered by Blogger.